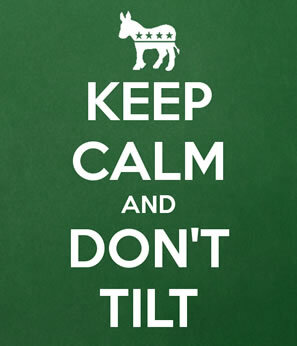 Are You Going “On Tilt” When Trading Binary Options? If you have ever chased losses, you know what it feels like to abruptly lose control of your emotions, your thoughts, and your actions. It can happen suddenly and without warning, and when it does, you may feel like you are helpless to get things back under control. When binary options traders engage in emotional trading like this, they lose far more money than they did initially. Whatever “spark” set off the fire, the resulting damaging is far worse than the initial loss. Traders who have played poker may be familiar with a similar phenomenon called “going on tilt.” In the poker world, this refers to a state of psychological or emotional frustration or confusion that causes the player to start making decisions that are less than ideal. Usually, this means adopting overly aggressive strategies that are unlikely to work, and which the player would never use in a more psychologically sound state of mind. Poker players usually go on tilt because they are frustrated with their own mistakes, with bad luck, or with other players. If you are curious where the phrase comes from, it actually originates with pinball. When a player at a pinball machine is having difficulty, and the ball is not going where they want it to go, they may physically try to tilt the machine in order to force the ball to go where they need. Likewise, a player “on tilt” in poker is trying aggressively to force the game back under control, but this desperate grab at control usually results in an even greater loss of it. Learn how else trading is like poker here. You are taking trades that you would normally bypass, because you feel like you would win if you just took more opportunities. This is overtrading, and it is also an on tilt behavior. You are wagering more money than you normally would on your trades, hoping that a really good trade will help you win it all back at once. This is a violation of your money management rules. You are trading at all hours of the day, foregoing your usual rest and your other responsibilities. Trading at the expensive of health, your day job, or personal relationships may mean you are trading on tilt. You feel overwrought and angry all the time, at yourself, at the market, at other traders, or even at people who are completely unconnected to your trading activities. Why Do Binary Options Traders Go On Tilt? Tilt behaviors result when we expect one thing and get another. Often what we are expecting is unrealistic in the first place. We are positive we are going to win a particular trade, and then we lose. It is so unthinkable that we become wildly frustrated, feeling robbed of an obvious victory. It also happens when we feel like we are out of control. We have a losing streak, and our unusually bad luck results in fear. Fear results in anger and frustration, and we fight back desperately to regain a sense of control. But instead of the short-term dosage of reassurance we are seeking, we get even greater losses. In this way, a short-term problem can spiral into a long-term one, and a small losing streak can become a big one. Sometimes what makes a trader go on tilt is even subtler than that. Instead of one particular infuriating loss or losing streak, it may be something more general than that. Maybe you have poured thousands of dollars into your trading career, purchasing trading systems, alerts, coaching programs, and more. Perhaps you have been studying for months now, doing your absolute best, and you still are not making a living as a trader. This can cause a kind of existential crisis, where you not only feel out of control of your trading, but also your entire life. A large part of coping with this is resetting your expectations and setting realistic goals. Trading for a living is a realistic goal, but believing you can do it within X amount of months or years may not be. The journey is just too individualized, and for every trader, that amount of time is going to be different. Numerous factors can influence your personal journey as a trader, and not all of them are going to be predictable. Sometimes you move forward quickly, while other times your journey may seem to drag. It is important to set qualitative goals rather than quantitative ones when you are first starting out. Make it your goal to be a better trader, and not necessarily to make a given amount of money within a certain time period. If you trade well, eventually success will follow. The other part of coping is to learn how to live with uncertainty, which can be an even greater challenge. All of us have a different natural tolerance for uncertainty, and some of us just have less of it than others. The good news is that you can train yourself to build up your tolerance, and over time, develop a healthier, sturdier mentality about it. You will never be 100% in control, not with binary options trading or anything else. That is a tough reality, but in it, you can learn to see opportunity and hope. After all, you may have no certainty of success, but at least your failure is not certain either. Nothing is written in stone, and even when things are looking bad, you never know when something unexpected will change for the better. One last bit of advice when you are trading on tilt is to back off from your trading activities for a little while so you can recover. You will always have some emotions involved in your trading; nobody is a robot. But you want to be trading when you can own your emotions and rein them in, not when they own you and control you. So take some time to do something else; study and test instead of trading live, and regain your confidence. Or maybe take a little vacation from trading altogether to recover your perspective. Once you are feeling more optimistic and have more realistic, moderate goals and expectations, you can get back to trading binary options, hopefully with greater success!